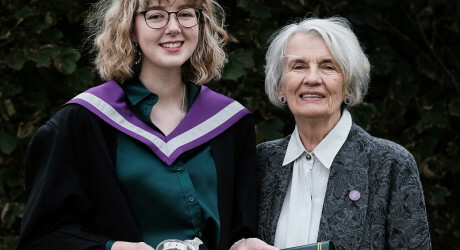 AN Evanton woman who was instrumental in establishing the University of the Highlands and Islands saw her granddaughter graduate with a first class honours degree from Orkney College UHI last month. Former councillor, Dr Val MacIver OBE, chaired the Highland Council steering group set up to examine the case for creating a university in 1991 and worked tirelessly to support the venture. She became the first president of the organisation’s community body in 1994, joined its board of governors in 1997 and became the institution’s third rector in 2004. Her efforts were recognised with an honorary fellowship and she attended the celebratory event which marked the organisation formally achieving university status in 2011. Dr MacIver had an opportunity to witness the fruits of her labours when she attended the Orkney College UHI graduation at St Magnus Cathedral in September to see her granddaughter, Niamh Mackenzie (21) from Evanton, collect a first class honours degree in culture and heritage. Niamh was one of over 200 graduates and award winners who attended the ceremony, which was presided over by Her Royal Highness, The Princess Royal in her role as Chancellor of the University of the Highlands and Islands. Niamh explained her decision to study with the university, saying: “Because of my Gran, I was always aware of the opportunities offered at the University of the Highlands and Islands. However, when I came to selecting my course, I had various choices on my UCAS form. The culture and heritage degree really grabbed my attention because it was a fantastic combination of subjects I was interested in. I had been to a lot of open days, but when I met University of the Highlands and Islands staff, they were so welcoming and genuinely wanted to help you get the most from your time with them. These factors made me feel it was the right choice for me.